Looking out into our backyard from the kitchen around 1pm last July, I spotted this gorgeous beauty flying restlessly, moving from the Curry Leaf Plant (Murraya koenigii) to the Annona squamosa (Custard Apple) tree, then back again to the Curry Leaf briefly and settled on the Pigeon Berry (Duranta repens). And my immediate reaction as I rushed to grab for my camera a few meters away was, “Wow! How big you are! How beautiful! Don’t go, please stay, let me get a shot of you first”. Stayed it did, but it flew so swiftly and impatiently around that I was only able to get one capture. That was it, only one unsatisfying blurry shot! Then I chided myself to be thankful for the butterfly’s visit and be contented! 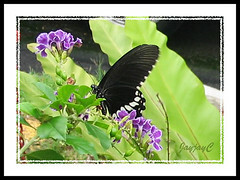 Common Mormon as it is commonly named, is classified as a large butterfly with wingspan about 9-11.5cm. 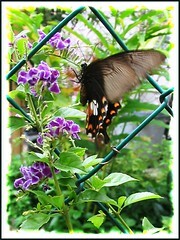 It is a very common species of the Swallowtail papilionidae family with a prominent tail on its hind wings. An interesting polymorphic butterfly that is well-known for its ingenious mimicry to conceal and protect itself from predators. Being edible butterflies, favoured by birds, two female forms of the Common Mormon will mimic the inedible poisonous Red-bodied swallowtails such as the Common Rose and Crimson Rose, to escape being eaten alive. How inspiring! 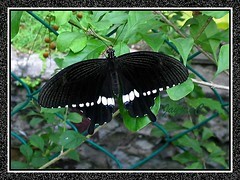 The male butterfly has one morph only and is predominantly black with a series of white marginal spots on its forewings, which are broader proximally. On both sides of the upper hindwing, centers a complete discal band of elongated white spots. It may or may not have marginal red crescents. The males are smaller in size than the females. Form cyrus – this typical female form cyrus resembles the male, though larger and paler in comparison and always has strongly marked red crescents. It is the least common of the three forms. Form stichius – this female form mimics the unpalatable Common Rose (Pachliopta aristolochiae) very closely. It is the commonest female form. Form romulus – this common female form mimics the unpalatable Crimson Rose (Pachliopta hector), though not as closely, being less vibrant in color comparison. It is easy to recognize the Common Mormon mimics from the Roses by the colour of their body – the mimics are black-bodied, whilst the Roses are red-bodied. I think this beautiful visitor that flew into our backyard, as captured in the above image is a Common Mormon, female form stichius, based on images at Wikipedia (link provided below). Range: Widely distributed across Asia. India, Nepal, Sri Lanka, Myanmar, Thailand, southern and western China (including Hainan (Guangdong province), Taiwan, Hong Kong, Japan (Ryukyu Islands), Vietnam, Laos, Kampuchea, Andamans, Nicobars, Eastern and Peninsular Malaysia, Brunei and Indonesia (except Moluccas and Irian Jaya). Habitat: Diverse habitats. Cultivated urban areas that include gardens and parks, as well as orchards of oranges and lime which are its host plants. It is to be found too in the forest and wooded regions or high up into the hills. Food plants: Like the Lime Butterfly (Papilio demoleus malayanus), the larval food plants of the Common Mormon are mostly plants in the Rutaceae family, especially Citrus species and Murraya koenigii. The adults on the other hand, can be found nectaring on a variety of flowers, especially with long corollar tubes such as Lantana, Jatropha, Ixora, Mussaenda, etc. 1. Wikipedia for the lifecycle of Common Mormon, and much much more. If you’re a nature lover, a must-see on the life cycle of Common Mormon by Somnath Paldas. You get to watch day by day photos & videos: from mating – laying egg – caterpillar – molting – pupa – emergence – adult butterfly! Absolutely astounding captures on the metamorphosis of Papilio polytes (Common Mormon)!